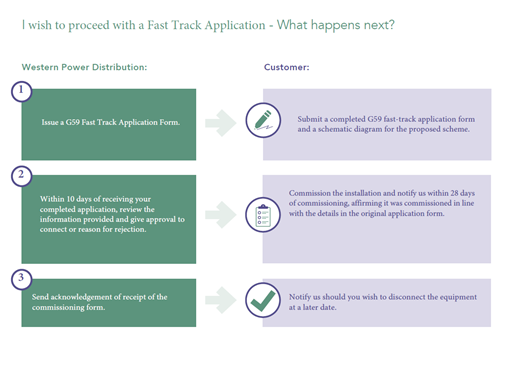 then subject to meeting further eligibility requirements, you may utilise the fast-track process. Are you applying to connect at a single property? Is the combined installed capacity of your generation and battery storage devices less than 32A per phase? Is the individual capacity of each of your generation and battery storage devices less then 16A per phase? Will your export capacity be limited to a maximum of 16A per phase via an export limiting device that is compliant with ERG100? Will both your generation and battery storage devices be connected via ERG99 type tested invertors? Will both your generation and battery storage devices be prevented from operating in island mode, i.e. when there is no mains supply? If you answer ‘No’ to any of the above questions you will need to apply under the conventional ERG99 route. If you answer ‘Yes’ to all of the above questions, you may proceed with a fast-track application. To make an application for connection, you may download an Application Form or contact your nearest applications team and ask us to send an application to you.